I wish I could have been a part of the late-90s shooter boom, but we could never afford a PC or any of those early 3D consoles at the time. Luckily gog.com exists in the present day and is slowly but surely unearthing all the shonky PC ports of strange games I glimpsed on billboards and in magazines but never imagined I would ever get to touch. 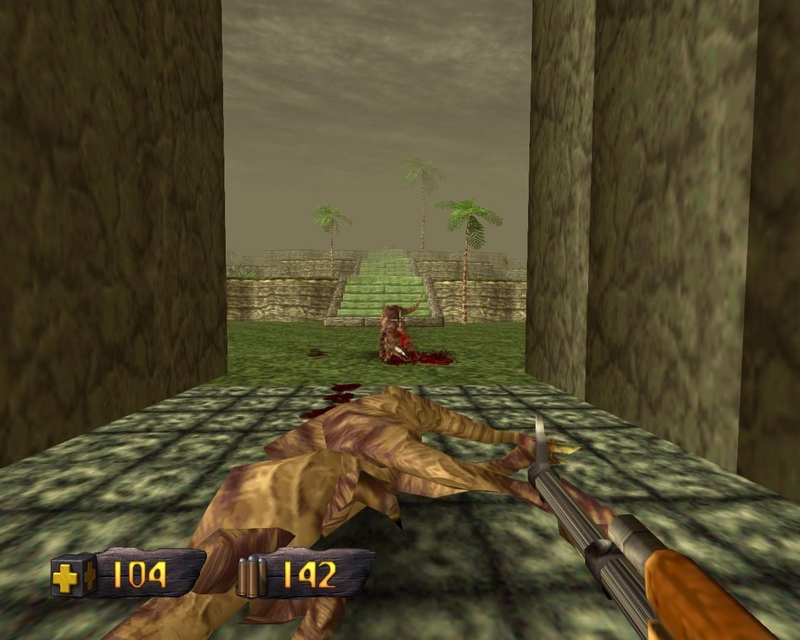 Turok: Dinosaur Hunter here is not the original game, but a (slightly?) remastered edition that was actually cranked out fairly recently. Generally I aim for purism — all official original patches and expansions but nothing more — but that’s not an option here so you’ll have to forgive my ignorance of the Original Version and take my review as being of… whatever they’ve changed/fixed/upgraded in this new version. 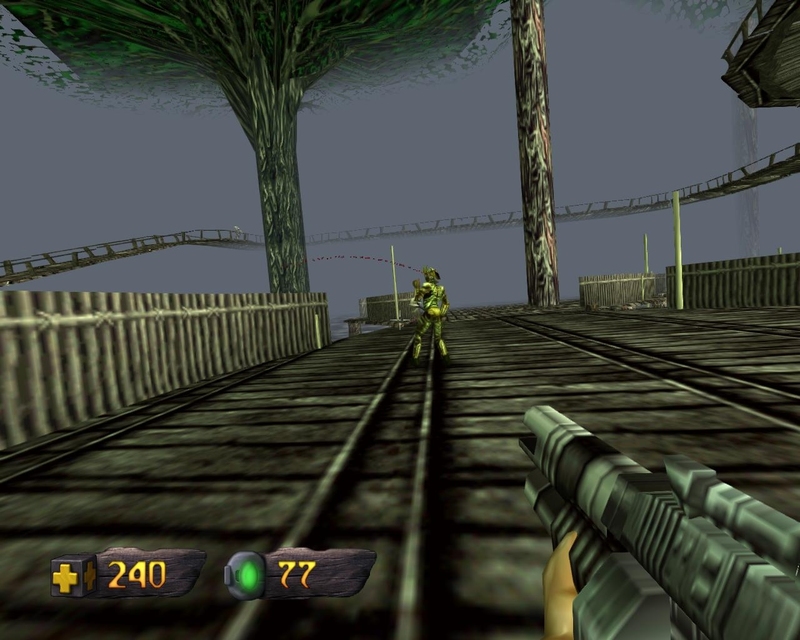 To be fair, Turok seems to have an eye on being more of a racing game than a straight-up FPS. The levels are expansive but your movement speed encourages a mad dash, while strafing makes you lean like you’re powersliding. Wheeeee! Of course it’s not actually a racing game. The emphasis is actually the opposite: it’s about exploration, scouring levels for keys to the next levels, golden triangles that give you extra lives and hidden pieces of the Chronoscepter. Well, exploration while fending off dinosaurs, human hunters, aliens and robots. Of course! Later on, even the dinosaurs get guns. Oh yes. Many enemies have amusing death animations like this man’s throat blood spurt, but for me that generally means wasting ammo on dead enemies that don’t look dead. Although the first two or three of the eight levels start with fairly sane layouts, after that things get messy and start to fork in fifty different directions. Some long and winding canyons lead to new weapons, some lead to the level keys you actually need to progress and some lead nowhere of note… Luckily there is an automap that fills in as you go, so you can tell which paths you’ve already been down. This is necessary mainly because the tileset isn’t particularly varied. 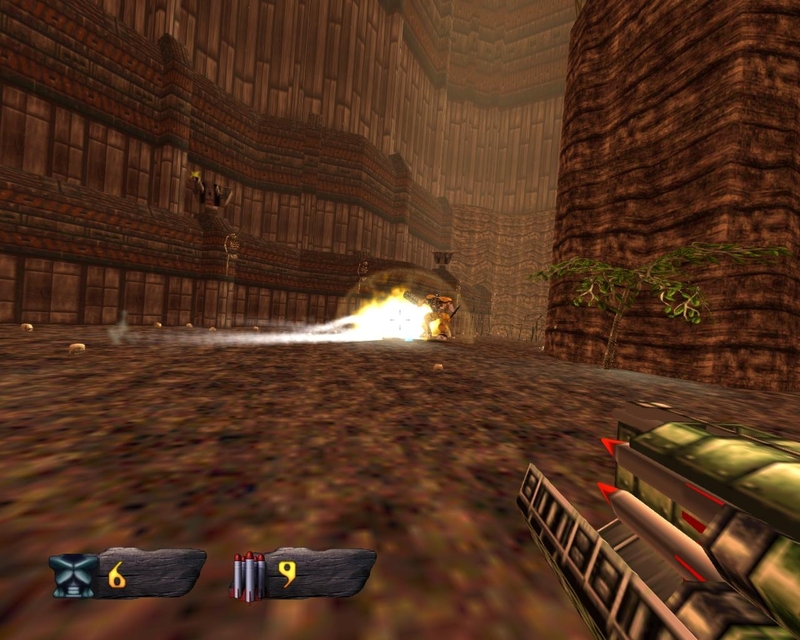 Six of the eight levels are cliffs, caves and ancient ruins; the seventh turns brown and volcanic before finally unleashing some future fortress architecture in true Sonic style. 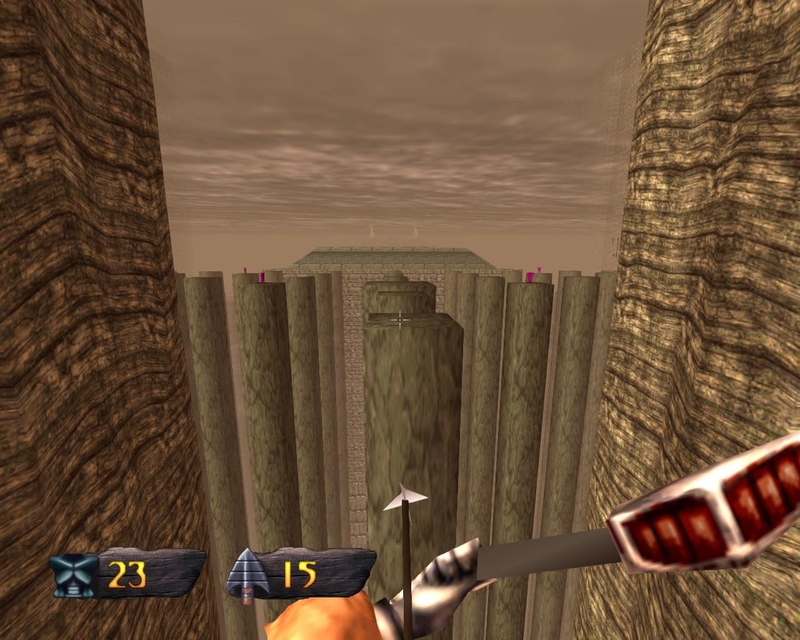 While some areas do have remarkable scenery, with striking obelisks and pyramids nestled amongst towering trees and cliffs that go all the way up into the clouds, most of the game is endless ravines lined with outcrops and log platforms where one route looks pretty much like another. 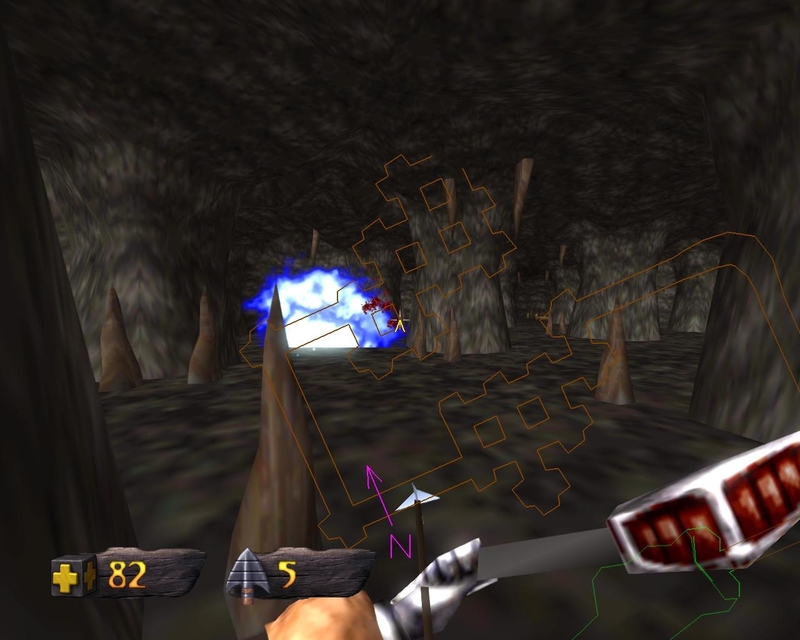 Even the tutorial concedes that you need to use the map when traversing cave systems, as they have even fewer decorative options than the open areas. When you see the map laid out you realise that the levels are not particularly complex after all. … But with some levels taking you up into the sky and others making you descend into the canyons, the sheer geographical area seamlessly covered is mighty impressive. 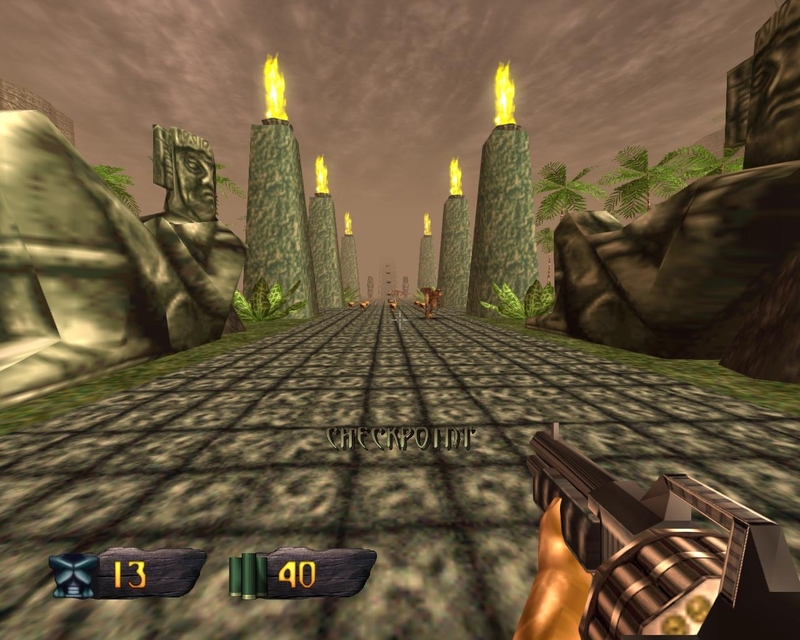 I guess a lot of that comes from technical limitations of the day — Turok isn’t just a late-90s shooter, it’s a late-90s shooter originally built for the N64. Saving is also hamstrung by ancient technology, limited to specific points with sporadic checkpoints for respawning in between. Checkpoints are interesting because as the levels become less and less linear they stop being useful as reassurance that you’re going in the right direction — however, they invite more racing game comparisons as they are starting-line-like pillars that you run between to activate… But every direction is correct and depending on where you’ve been you may trigger one either way. It is capable of cracking open the decorations for a neat vista, but I guess there’s a tight limit on their density. Thankfully, should you miss anything important while getting lost in each level, you are quite free to go right back in for another go. The game revolves around The Hub, which contains the portals to each level and a handy save point. Each level contains three keys for one or two of the next levels, and each portal requires three keys to unlock, so thorough scouring is imperative. Only a few enemies respawn on subsequent visits so it’s easier to take your time and look around on a second go. Of course, repeated traversals of levels might not be an issue for the enemies — we are here for the shooting after all — but many are graced with some absolutely hideous jumping puzzle sections. Perfect positioning is required repeatedly and often for sustained periods, with failure zapping you back to a checkpoint at the start or some other long-way-round. I’m not sure if the amount of air control the game gives you makes these puzzles worse or better. Holding down the jump button will give you a continued boost and holding down movement keys will change your direction. While it feels quite cool when you manage to jump around a pillar to get up to a secret area ledge, it’s less cool when mistimings and awkward recovery attempts keep carrying you over the pillar you’re aiming at. For a shooter, unfortunately the weapon roster is a bit of a mixed bag too. A good two-thirds of the game is spent with pretty basic standards; pistol, shotgun, assault rifle, auto-shotgun, which are all just fine. 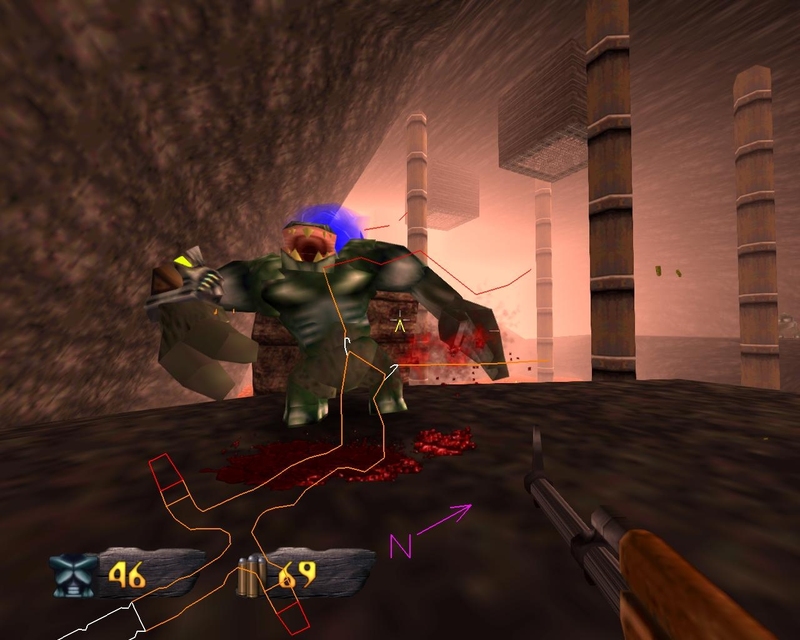 Though there is variance in the shotgun also offering explosive shells which override normal ones until they’re exhausted, and explosive arrows for the bow are reasonably common. Unfortunately when it looks like things are starting to get exciting, they instead get finicky and unpredictable. The imaginatively-named “Alien Weapon” unleashes beautiful green firework displays… that don’t actually seem to do much damage (and have a habit of exploding before the beam has actually impacted something). 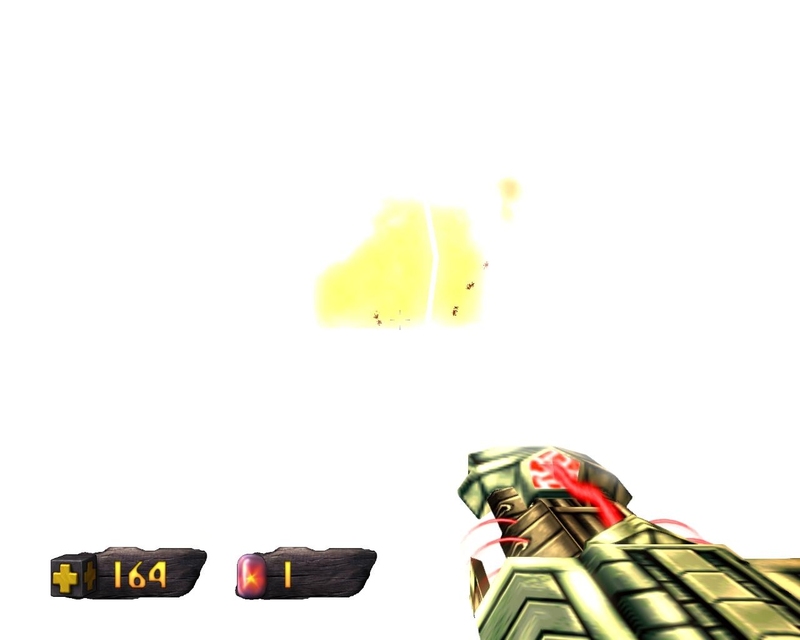 This is bad in two ways: an explosion of that magnitude looks like it should one-hit common enemies, but it doesn’t and they are then hidden in the blazing haze, making it difficult to continue firing on them until they actually die. Then there’s the Shockwave Weapon, a weapon which requires charging up but which only seems to have any effect at all if you catch something dead on — a very difficult proposition at these movement speeds. Might as well use your Energy Cells with the dependable but less flashy Pulse Rifle, but that’s no way to spend your time in a game as mental as this! Nobody should be using a bog-standard assault rifle in the closing stages of a mad-cap time-travelling sci-fi. Like all good 90s games, there is a multi-rocket launcher… Sadly it’s a very late introduction to the roster. Though the Fusion Cannon looks massive and does actually obliterate everything. Which is a shame, because it’s fast and it’s daft and when it gets going it is hilarious good fun. Obligatory call for a level editor and modding tools? 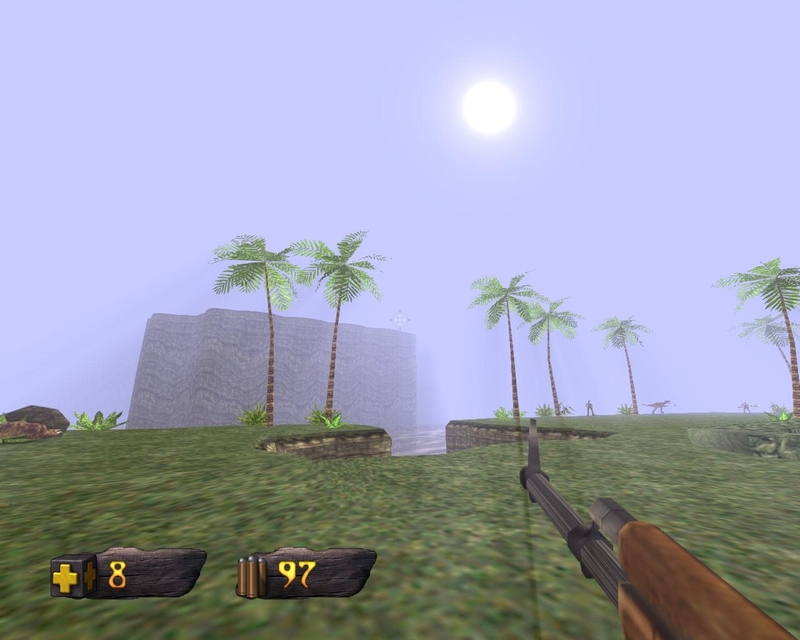 This entry was posted in Gaming and tagged first-person shooter, FPS, Iguana Entertainment, late 90s, late to the party, Night Dive Studios, Turok by Rao Dao Zao. Bookmark the permalink.